The 40.5 metre motor yacht Manifiq has completed a winter refit and is available for charter again — this time with a Spanish charter licence. The refit included a new Jacuzzi spa and external furnishings, along with a completely new interior. In addition, there is now an 88 inch curved television screen in the cinema room. Manifiq has proven herself to be a very popular charter yacht, elegantly combining a luxurious interior with state-of-the-art technologies. With five comfortable cabins, Manifiq sleeps 10 guests in one master suite and four impressive and sizable double cabins. Each boasts light and luxurious soft furnishings giving a feeling of tranquility; state-of-the-art entertainment systems and en suite bathrooms with luxurious amenities. The remainder of her interior, designed by Luca Dini Design creates a very welcoming retreat. From her modern dining area to her ultra-cool cinema room, Manifiq has everything to keep a group of friends or family occupied. Exterior living offers plenty for those who love al fresco living. Chose from multiple outdoor dining options, a dip in the Jacuzzi or just enjoy lazy days on deck just taking it all in on one of the large sun pads or loungers. For those who enjoy getting out on the water, Manifiq offers a very wide selection of water toys. From snorkellingequipment to water skis, wake boards to sea bobs, she even features enough scuba diving equipment for four. 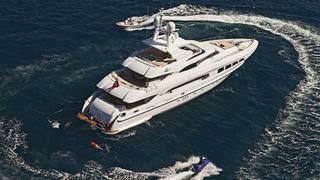 Manifiq charters at €145,000 per week through Imperial Yachts.